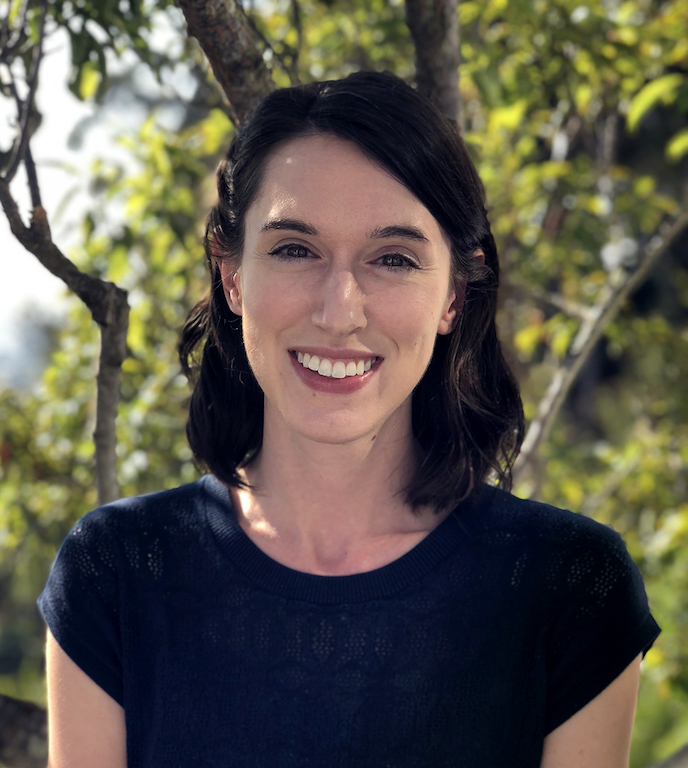 Emily Cooper is not only a graduate of the Helen Wills Neuroscience Institute PhD program—she is also a HWNI faculty member. Six years after graduating from Berkeley, Cooper returned this summer as an Assistant Professor in the School of Optometry & Vision Science Program. Cooper’s research focuses on human visual perception, particularly in three dimensions, and how it is used in natural environments. Additionally, she uses her findings about natural vision to help make better display technologies. Cooper began working on 3D visual perception in natural environments as a graduate student in the lab of Martin Banks. She then did a postdoctoral fellowship with Anthony Norcia at Stanford, where she continued this type of work, but also began using her research findings to help improve display technologies through collaborations with industry. After that, she moved to Dartmouth for her first faculty position, but then jumped at the chance to apply for an open position with UC Berkeley’s School of Optometry, and joined their faculty in 2018.
Cooper was excited to come back to Berkeley, not only because she enjoyed it as a graduate student, but also because of the numerous opportunities at Berkeley and in the wider Bay Area to collaborate with academic and industry researchers to make new discoveries about visual perception and apply them to technologies such as virtual and augmented reality. One draw for her in particular was that her lab was able to join the recently launched Center for Innovation in Vision and Optics (CIVO) at Berkeley, which facilitates and supports these types of collaborations. Read the following Q&A with Cooper to learn more about her path in science, her research and its applications, and how her experiences at HWNI shaped her career and forged a long-term friendship and scientific collaboration. This interview has been edited for brevity. Rachel Henderson: How did you first become interested in neuroscience? Emily Cooper: I was an undergraduate at the University of Chicago and an English major. The University of Chicago had a large set of distributive requirements, and I was taking a course called “MIND” which had a mixture of some introductory neuroscience, cognitive science, and psychology. I loved that class. At some point, Professor Steven Small came by the class and said he was looking for research assistants. It piqued my interest, so I applied to be an assistant in his lab. For the rest of my time in Chicago, I worked as a research assistant in Dr. Small’s lab. The lab studied human language, using tools from fMRI. It was actually a nice transition for me from being an English major, interested in literature and communication, to thinking about language from a scientific perspective. RH: What led you to want to do a PhD? EC: I knew I wanted to stay in school longer and get more expertise in a particular area. In looking at graduate programs, I started looking broadly, and it was apparent to me relatively quickly that I was zeroing in on interdisciplinary neuroscience programs. It sounded exciting to me and felt like the right fit. The Berkeley Helen Wills program was right in that sweet spot of interdisciplinary neuroscience training. Interdisciplinary training was what I felt like I needed in order to get to where I wanted to go. RH: Were you interested in any particular faculty at HWNI or did you choose it more because it was broad? EC: It was probably the breadth that appealed to me, partially because I wasn’t exactly sure what I wanted to do. I liked the idea of a program that had a broad set of areas covered in the affiliated faculty, and that had lab rotations. Lab rotations were a big draw for me, because I felt like I needed a little more experience in different things before I decided what I ultimately wanted to focus on. RH: Who did you rotate with? EC: My first rotation was with Rich Ivry and then I rotated with Jose Carmena. Marty Banks was my last rotation, and that was ultimately the lab I joined. I didn’t have any prior experience studying vision, which is what Marty’s lab does, but I had enjoyed my coursework in sensation and perception. So ultimately, that lab felt like right fit for me. 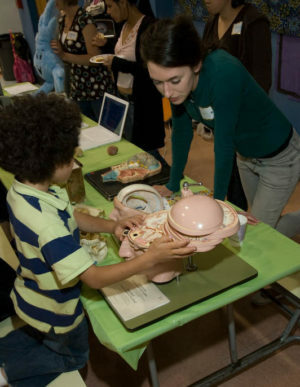 Cooper as a graduate student in 2008 volunteering at Mind & Brain Night, an after school educational event organized by HWNI PhD students. RH : What was your general graduate school experience in Helen Wills? EC: I loved my time in Helen Wills. It was just the right environment for me, it was the right type of training, and I made lifelong friends. The training environment contributed to my ability to grow as a scientist and to develop my career further after I left. I couldn’t have asked for a better environment to train in for graduate school. RH: Tell me about your thesis research at Berkeley. EC: My research is in the area of human visual perception. My dissertation research was focused on the idea that in order to understand any perceptual system, such as the human visual system, you also have to have a deep understanding of the natural environments in which that perceptual system evolved to operate, and the tasks that the organism needs to perform. Within that framework, my dissertation was focused on stereoscopic vision—the ability to combine information from the two eyes, in the service of perceiving depth information in the environment. My work examined ways in which stereoscopic vision in humans is adaptive for the very particular demands placed by the natural environment that humans live in. RH: What type of approaches were you using to study this? EC: A lot of my studies used traditional visual psychophysical techniques—perceptual experiments using controlled visual stimuli presented to human observers. But we ran those studies in a way that would connect back with natural visual experience. In one of the studies that I ran in grad school, we had developed the hypothesis that people of different heights would have different properties of their stereoscopic vision—so shorter people should have a different pattern of stereoscopic sensitivity than taller people. This hypothesis was based on our understanding of typical visual behaviors. So we recruited people with as much variation in height as we could. We recruited basketball players, and we got help with advertising our study via the San Francisco Bay Area chapter of the Little People of America—a non-profit organization supporting people of short stature. We were combining these straightforward psychophysical techniques with methods that look at natural visual behavior. So another thing we did was to build a device that people could wear when they walked around and did typical tasks. The device would measure where they were looking, and also three-dimensional information about what was in front of them. I worked closely with a Vision Science graduate student, Bill Sprague, a postdoctoral researcher, Ivana Tošić, and several other people including people in the Redwood Center, on that system. Actually, one of the tasks was that the participants would go to Yali’s Café and order a cup of coffee, which any Helen Wills student knows is a very natural behavior (laughs). We were able to take those data—which were fundamentally data about the world and the way that people interact with the world—and show that they were well-matched to these basic properties of stereoscopic vision that we measured in the lab. RH: Tell me about what you did after graduate school. 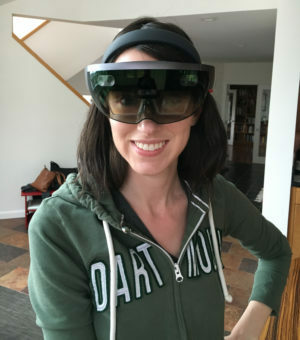 Cooper in 2016, wearing the Microsoft HoloLens, a head-mounted mixed-reality display. EC: After I graduated in 2012, I moved to Stanford and did a two-year postdoc with Tony Norcia. There, I continued to study depth perception, and also expanded my experience by looking more into applications of research on visual perception, particularly as it relates to display technology. We were specifically working with Sony, examining potential ways to make natural images appear more three-dimensional. Then I moved to a research assistant professor position at Dartmouth College in New Hampshire. While I was in graduate school here at Berkeley, I met my future husband [Hany Farid] who was on sabbatical here, but was on the faculty at Dartmouth College. After spending a few years traveling back and forth between the coasts, we decided to move to Dartmouth. I had moved to California from the Midwest, and before meeting Hany I thought, “I’m never leaving California, this is amazing, I’m just going to stay here forever!” But it was a surprisingly easy decision to move to New Hampshire because it is such a wonderful place—although completely different from the Bay Area. After deciding to apply and getting a job offer, my husband applied as well and was also offered a position on the Berkeley faculty in the School of Information and EECS. We decided that this was an exciting opportunity for both of us, and moved here this July. RH: What projects are you starting now in your lab at Berkeley? EC: Right now, there are two postdocs and one graduate student in the lab. The lab has two complementary branches of research that we focus on. One is continuing our work on understanding how vision operates in natural environments, with a particular emphasis on 3D vision and on human vision. The other branch of research is to take what we have learned about human vision, and try to apply it to improve commonly used or emerging display technologies. In particular, we are currently focused on virtual and augmented reality. The emphasis of each person’s research in the lab varies in terms of whether they are focused on the basic questions of natural vision or the more applied questions. We also have a new collaborative project, where we are collaborating with a group of neurobiologists that study different fish species. We’re trying to think more about how the vision of that particular organism is adapted to its own natural environment, which is a new challenge for us in the lab. But we’re enjoying getting up to speed on a very different type of visual system in a very different type of environment. RH: How are you doing your applied work—are you collaborating with companies? EC: For the past few years, I have been collaborating with and receiving research support from industry, particularly companies interested in developing new types of display technology. By communicating back and forth with companies, it helps us to think through the big picture of what types of displays are possible, and what types of future applications people are thinking about. So that’s been a productive and positive part of getting to develop my own research program. One of the nice things about being in the Bay Area is that there are a lot of events and groups that bring together academic and industry researchers to communicate about different priorities and open questions. As a lab, we’ve joined a recently launched center called CIVO—the Center for Innovation in Vision and Optics—at Berkeley. It has a mission “to promote the development, use and dissemination of innovative optical technology for the healthy and diseased eye.” That was actually a big draw for the lab—the launching of the center and the fact that we could be a part of it. RH: I noticed on your website that you list HWNI PhD program alum Allyson Mackey as a collaborator—did you meet at Helen Wills? EC: Actually, Allyson and I met when we were interviewing for other neuroscience PhD programs, prior to interviewing at Helen Wills. Just by chance, we were assigned to be roommates at two separate interviews. We just hit it off. We both decided to come to Berkeley and got an apartment together. We lived together for about three years, and Allyson is still one of my best friends. In fact, we also have a research collaboration—she is on the Psychology faculty at the University of Pennsylvania. I actually just sent off the proof of a review article we wrote together! RH: How does it feel to come back to Berkeley as a faculty member after being a grad student here? EC: It feels great to be here. There were things I loved at all the other places that I’ve been, but being away helps you really appreciate the things that are unique about a place. It’s nice to be back, and to be reminded of the things that are unique and wonderful about being here.